Pioneers in the industry, we offer battery operated grease gun-19.2v-bpgg/19/eu from India. BPGG/19/EU-Cordless Grease Gun with 220V/50Hz Battery charger,2pin plug.Powerful 19.2V high torque motor,standard1.5Ah Ni-Cd battery pack.Automatic air release valve bulk loader.One hour quick charger.each battery charger provide power to dispense upto 2.4kg grease in free flow condition.complete with 30" high pressure hose with spring guard on both end with high pressure 4jaw couples. 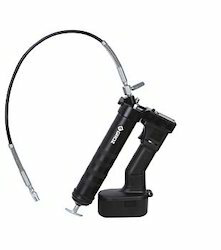 Looking for Battery Operated Grease Gun ?